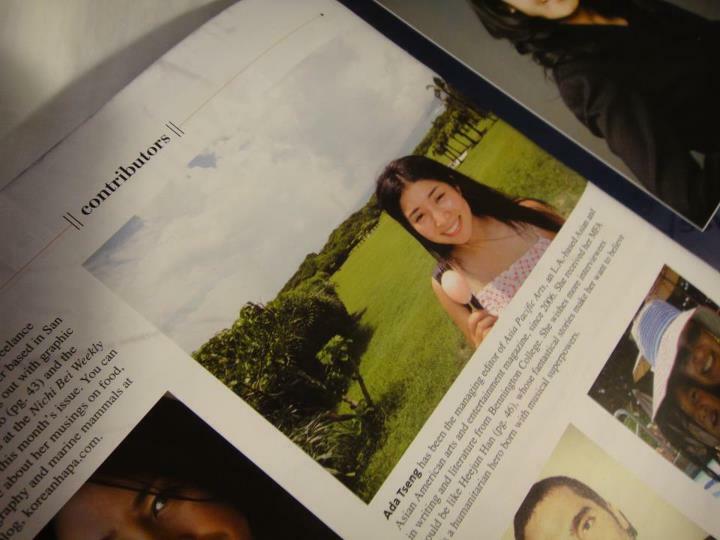 Thanks KoreAm for featuring me on the Contributor’s Page of the July 2012 issue! The singer may have been voted off American Idol, but he explains why his cup, full of colorful hues, runneth over. American Idol finalist Heejun Han remembers when his kindergarten teacher in Korea asked him to draw the ocean. He made it red. Concerned, she asked him to draw the ocean again the next day. This time, he painted it green. At first, his mother thought he might be colorblind. But what they discovered was that the colors he used for his drawings were connected to the songs that were playing in the classroom. So 5-year-old Han would see his surroundings in different hues depending on the music he was hearing. The millions of viewers who watched Han place ninth in the 11th season of the popular reality TV competition— the farthest a Korean American has gone thus far (former contestants Paul Kim and John Park failed to crack the Top 12)—might wonder if Han is just playing a prank on his interviewer. After all, this is the same jokester who consistently called American idol judge Jennifer Lopez “his wife,” told designer and idol image advisor Tommy Hilfiger that he wanted to dress like Madonna and Michael Bolton, and was reprimanded by judge Steven Tyler for not taking the competition seriously enough. But Han is very serious. He still experiences music through color (He used to confuse collaborators by asking, “Can we get a little yellow on it? A chord that’s bluish but kind of red?”), and he has a “videographic” memory that’s triggered by music (“If Justin Bieber’s ‘Boyfriend’ was playing in the background now, then five years later, if I heard the same song, I could recount this exact scene in my head.”). No wonder, for much of Han’s life, he kept his musical talents to himself. Back then, psychologists thought he was crazy, and he still has mixed feelings about the pills they prescribed to rid him of what he considers his extraordinary gift as a songwriter. Born in South Korea before moving to Flushing, New York, at age 12, Han decided to return to Korea to pursue a singing career. The then-19-year-old thought he could break into the music industry more easily there, but after two years, he returned home empty-handed and found himself in a deep depression. Back in high school, his cousin had introduced him to Milal Mission, a New York-based Christian nonprofit organization that works with the disabled. Han had volunteered there to fulfill a community service requirement. After his disappointment in Korea, he returned to Milal for a different reason: he needed love. Although Han initially started volunteering to make himself feel better, he was soon inspired by the youth. “They are so satisfied with what they have, and they live life without thinking about what’s going to happen tomorrow,” says Han. “They give hugs to everyone, regardless if you’ve taken a shower or not, whether you’re wearing weird clothes. They don’t judge people because they’ve been judged from their birth. From the very first audition, Han understood what would make for great television. He played up his nervousness, so that those prone to underestimating bespectacled Asian men would be shocked by his smooth, soulful voice. He goofed around backstage, but belted out earnest ballads onstage. As weeks passed by, the young man who had only sung publicly in front of a small crowd of Korean grandmas at church suddenly had mainstream America weighing in on his song selections, commenting on his bromance with eventual idol winner Phillip Phillips, and wondering whether his talents were actually better suited for comedy. But, most importantly, he had given Milal Mission national media exposure and attracted numerous charitable donations. More than three months after being voted off idol, Han is rehearsing for the upcoming idol summer tour, which will begin this month. He’s juggling still-confidential offers from American television shows, and he will start writing and recording his solo album, which will first be released in Korea. He will be writing songs in both Korean and English. Despite being more influenced by Western soul and R&B music, including Tony Bennett and Stevie Wonder, Han finds it easier to write Korean songs. Han is not interested in making masterpieces. This time, he’s not chasing success. His newfound fame, as he explains, can never compare to the more permanent spiritual happiness he derives his family, his church and “his kids,” as he calls his disabled friends at Milal Mission. This article was published in the July 2012 issue of KoreAm.